Every moment we get with Donald “Cowboy” Cerrone where he’s not unconscious is a moment to cherish. And that’s just what we got in the co-main event of UFC Fight Night 139. Years ago, Cowboy would’ve been immune to the threats posed by an overpowered slugger. But the passage of time, and the eating of many knuckles had made Cerrone mortal – and few can test the limits of mortality like Mike Perry. So yeah, it was a little scary that old man Cerrone was going to face Perry in the UFC’s Denver event last night. Because Perry may not be a world-beater, but he’s really good at punching dudes unconscious. What would that mean for our beloved Cowboy? Thankfully, the man with about 800 UFC fights on his record dodged Perry’s efforts to decapitate him, and after clinching and trading knees, the fight eventually went to the ground. And though Perry was on top, hunting for a chance to put his fist through Cowboy’s skull, instead came an armbar from the man on the bottom. Perry tried to escape, but was soon forced to tap. THAT’S IT!! @CowboyCerrone taps Perry in round 1! I would say the good guy won, except Perry was totally a gentleman before, during and after the fight. I guess it’s hard to have bad blood against a dude as cool as Cowboy. The post UFC Fight Night 139 Results: Cowboy Doesn’t Get Killed, Instead Taps out Mike Perry appeared first on Caged Insider. In three days, you’re gonna like me. You’re gonna like me in three days. I have question for Ireland. What about your language? What about Irish language? Where is your language right now? What’s wrong with your language? “You guys change it? What about your language? Please someone can give me answer? You guys with England right now? Someone will need to ask Conor about his grandfather Christopher’s story. I’m sure it will come up at the press conference- if McGregor shows up on time. This will be fodder for the class-action anti-trust lawsuit. Go support Ray Borg and buy his T-shirts! In this great article interviewing past McGregor and Nurmagomedov opponents, Eddie Alvarez talked about McGregor’s ‘hypnotic’ calm in the cage, and this clip really shows his ability to go from 0 to murder in a split second. The statistics for this fight are surprising, especially Khabib’s striking scores. Side note: okay, Dillon. Whatever you say. Anthony Pettis vs. Tony Ferguson is an amazing co-main event. Why did anyone feel the need to do this? 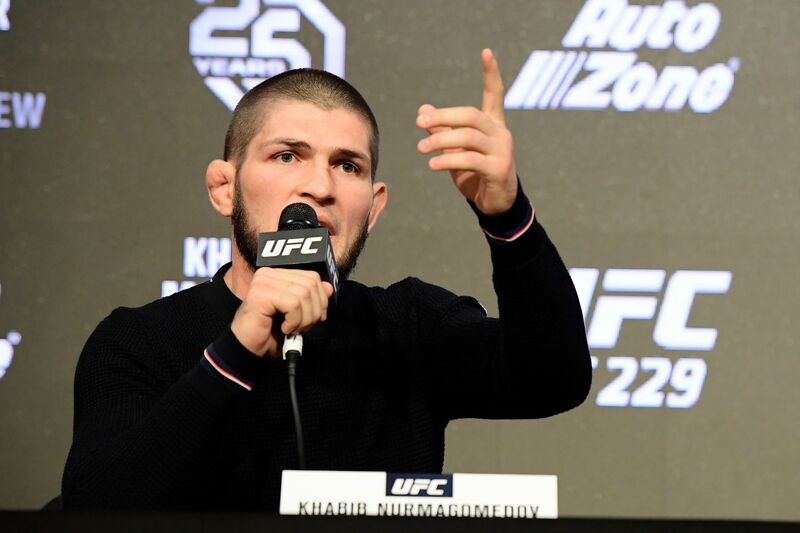 One of these fights got cancelled, but who should you watch for this weekend at UFC 229? The post VIDEO: That Time Robbie Lawler Nearly Killed Josh Koscheck appeared first on Caged Insider. CES MMA alum Devin Carrier was killed in a single-car crash on Saturday in Lakeville, Massachusetts, according to a source close to the organization. The post UFC 201 Primer: The Night Rose Namajunas Killed Our Girl Paige appeared first on Caged Insider.